When Mexico won independence from Spain in 1810, the area became Rancho de la Nacion. Frank Kimball and his brothers, Warren and Levi, bought the parcel of land in 1868 and modernized the area, building the first roads, a post office and wharf for sea trade. National City gradually came into being. One landmark with historical significance is the National City Railroad Depot, which was built in 1882 and served as the West Coast’s first station for Santa Fe Railway’s transcontinental railroad. It also helped Santa Fe Railway break the Southern Pacific Railroad’s monopoly over California’s economy and transportation. The Mile of Cars auto mall is the major industry that contributes to National City’s bottom line, drawing price-conscious car shoppers from around the county with the ability to comparison shop within a one-mile stretch. Reynoso said people who live outside the city are exempt from the additional 1 percent district sales tax on exempted items, which can make a difference with big-ticket goods like cars. National City is emerging as a regional leader in smart growth. The city has built over $30 million in public projects in the past five years and is planning more for the next five years. 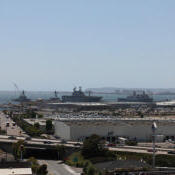 National City has a strategic location that is in the center of all the activity in the San Diego region. Granger Music Hall is an Irving Gill designed acoustical masterpiece located in National City. The Music Hall is listed on the National Register of Historic Places and is available to rent for weddings and recitals. National City has restored a number of its Victorian buildings and preserved its heritage as a gracious turn of the century town for posterity. National City is thriving with new projects and development attracted by its affordable housing and strong committed work force.